The design is not what you would call top of the notch. Dürer was in no danger of being eclipsed by this particular printmaker. It was the “P. Revere Sculp” signature in the bottom right that made Malchodi realize the piece might be historically significant. She brought it to Richard Noble, the rare materials cataloguer for the John Hay Library, and he recognized the style as typical of the work of silversmith and Revolutionary War hero Paul Revere’s print work. “That’s just crude enough to be him,” is how he put it. Noble did some research to see if he could confirm the print was made by Paul Revere. He found out that not only is the print documented as one of Paul Revere’s engravings, but it’s extremely rare with only four other copies known to exist. Even rarer, this print is the only one of the five to have the full plate mark visible. The other four have been cropped, removing the mark left by the edges of the metal plate when it was pressed against the paper. 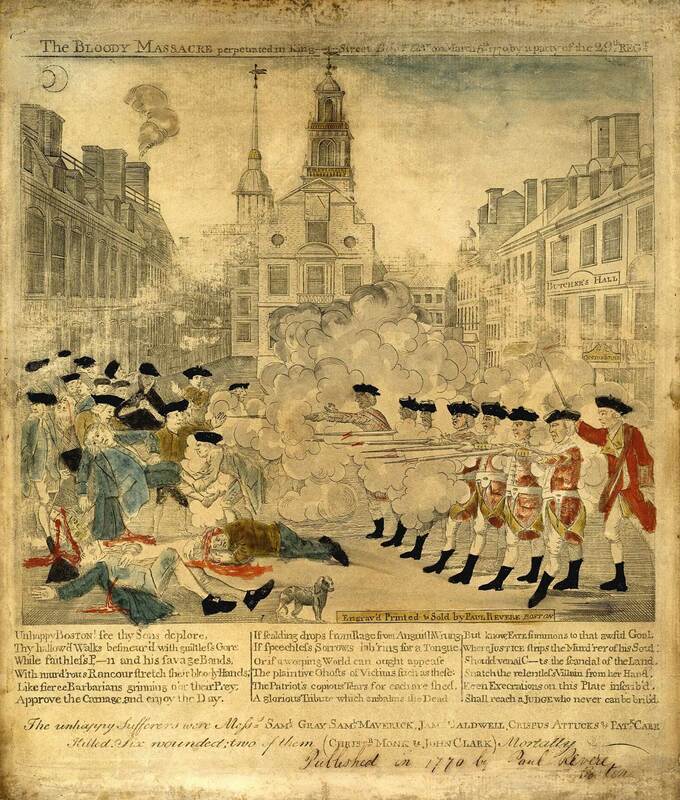 Revere began making prints in 1765, most of them on political themes supporting the colonial cause. He didn’t always make the original drawing, however. 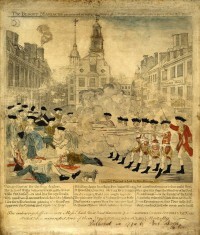 One of his best known prints, “The Bloody Massacre perpetrated in King Street, Boston on March 5th 1770 by a party of the 29th Regiment” was copied from an original drawing by Henry Pelham. Why did Revere create the print in the first place? How did the Drowne family come to own it? Based on Jesus and John’s position chest-high in the water, Noble categorizes it as a theo-political cartoon depicting a Baptist ceremony. In his book, Brigham indicates that he could find no evidence that it was ever used publicly in a book or religious pamphlet. 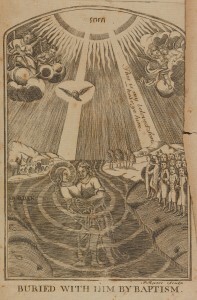 He also could find no model in any British book or periodical that Revere might have used as inspiration for this style of baptism depiction. Noble believes it may have been a one-off printing, meaning that Revere only made a few at a time to give to friends and close acquaintances who requested it, which also explains why the print is so rare. “It appears to be an American original, by an American original. The son of French Huguenot refugees who eventually became, by all accounts, a Unitarian. The print thus marks a stage in the evolution of that aspect of Revere’s life,” Noble said. Solomon Drowne and his family were prominent members of the First Baptist Church of Providence, Rhode Island, also known as the First Baptist Church in America because it was in fact the first Baptist church in America, founded by Roger Williams in 1638. Drowne was dedicated to the Revolutionary cause, serving as a surgeon for the Continental Army from 1776 to 1780 and then as ship’s surgeon on the privateer sloop Hope. (He published a journal about his time on board the Hope; pdf here.) It’s certainly conceivable that Paul Revere might have given the print to Drowne, but he could have gotten it any number of ways.